Is it honest or is there fraudulent manipulation? First fines have been imposed for manipulation of the gold fixing, the silver fixing is even discontinued entirely. But is everything in order with the platinum fixing? Have there been manipulations – and are they part of a larger manipulation campaign? The precious metals fixings have the purpose of enabling large volume trades. However, they also provide reference prices, which are used by merchants and have an effect on subsequent trades. They are therefore an especially suitable target for price manipulations. There have already been statistical hints as far back as 2002 that systematic manipulation of the gold fixing was taking place; in 2011 similar hints emerged in the silver fixing. We now want to examine the platinum fixing. It takes place twice daily, at 09:45am (AM fixing) and at 2:00pm (PM fixing) London time, which is equivalent to 4:45am and 9:00am EST. It takes a not precisely predetermined amount of time lasting several minutes until the fixing price is established. There are reliable methods to trace price manipulations taking place at specific times of the day. Calculation of an average intra-day price trend over many days often provides clear evidence. Similar to gold and silver, this method can also be employed to uncover systematic manipulation in the platinum market. We use one-minute prices of futures contracts from December 1997 to April 2014. From these we calculate the average of intra-day price movements. 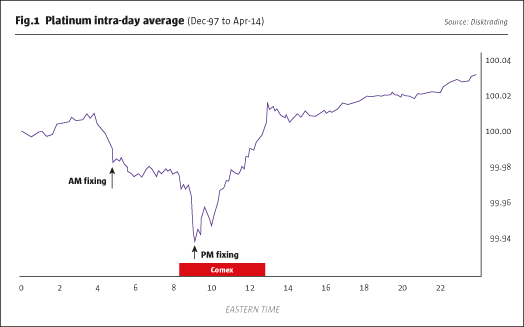 Fig.1 is therefore no normal intra-day price chart. It rather shows how the platinum price has behaved in the course of the average trading day over approximately the past 16 years. It shows the typical movements – calculated from millions of prices. The horizontal axis shows the time of the day (EST), the vertical axis the average price level (indexed to 100). Since it is an average over a great many days – 4189 all in all – the size of the moves is relatively small. On the chart, several points in time can be discerned when the average price behaves conspicuously. Especially noteworthy is the decline at the PM fixing. There is, however, also a mild decline at the AM fixing and when the main trading period begins at the COMEX at 8:20am. Interesting also is the slightly accelerated advance near the close of COMEX trading at 1:05pm. This indicates an upward price manipulation. Trading house Moore Capital was fined for precisely such manipulations at the close of trading – a nice confirmation of the method’s validity. However, most conspicuous are the price moves at the PM fixing. We want to examine these more closely. 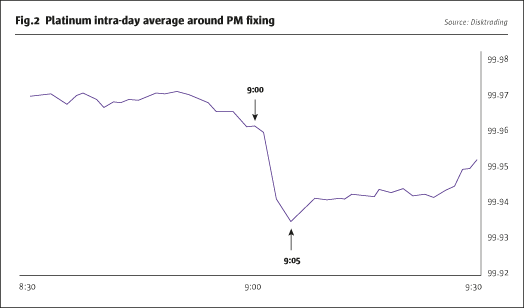 For this purpose, we take a closer look at average intra-day prices around the time of the PM fixing. Fig.2 shows a close-up of the previous chart, including the 30 minutes before and after the beginning of the fixing. We can see that prices begin to slowly decline from 8:50am onward. Once the fixing begins at 9:00am, the price decline accelerates between 9:01 and 9:05. Thereafter, average intra-day prices already begin to embark on a counter-movement. From this progression it can be surmised that the typical duration of the fixing over these years was approximately five minutes. For the further examination we will limit ourselves to studying the interval between 9:00am and 9:05am (the “fixing period”). Any manipulations that take place at other times – including those in the minutes preceding the fixing – are not pursued further at this juncture. We thus analyze the price movements of the five-minute interval between 9:00am, the beginning of the fixing, to 9:05am, the time when the downward move on the average intra-day price chart ends. During this time period, the strongest part of the decline occurs. The PM fixing takes place concurrently. The study includes the price moves of altogether 4189 days – a time period of 16 years. On average, platinum prices fell by 0.0272% in the five minutes of the afternoon fixing. Given that platinum actually rose from $376 to $1,440 during those years, a slight increase would normally have been expected. During the 4189 fixing phases there have been 1730 price increases and 2195 price declines. 271 times prices remained unchanged. One would have at least expected as many price increases as declines. Statistically, there is therefore an excess of 236 price declines at a minimum. A coincidence? We now take a closer look at the distribution of these returns. Fig.3 shows the distribution of price changes in the five minutes under consideration in steps of 0.02%. The first value on the right-hand side of the centre, for instance, means that prices rose between 0% and 0.02% 224 times during the fixing. Another example is further to the right, when the price of platinum rose between 0.3% and 0.32% on 20 occasions. However, contrary to other histograms, a certain differentiation is necessary in this case: the 271 cases when prices remained unchanged during the five-minute interval must neither be included with rising nor with falling prices. They are therefore displayed in a separate column in the center. It can be clearly seen that the bars to the left of the center are larger than those to the right. This confirms that there have been more price declines than advances. Thus there have, for instance, been 221 occasions when prices declined between 0.04% and 0.06% during the fixing. The respective number of price increases was only 168. This tendency can be observed in almost all groups. It is also visible among the stronger price moves shown at the edge of the illustration. The number of price declines of more than 0.5% with 93 occurrences was more than double that of similarly strong advances with only 41 occurrences. In almost all groups, more declines than advances have been recorded. Only in two of the groups was this not the case. Overall, the additional declines are distributed quite evenly. The distribution diagram underscores that there has been a systematic tendency for prices to decline during the fixing. Individual statistical outliers cannot be the reason for the strong declines in the course of the fixing. Due to the size of the sample, coincidence can also be ruled out as the reason for the statistical anomaly during the platinum fixing. What about other reasons not connected with manipulation? Similar to platinum, there are also systematic price declines in gold during the fixing. Numerous explanations have been proposed in this context, such as, for instance, central bank sales. These proposals could, however, not explain the phenomenon. There is no reason to expect things to be different in platinum’s case. In the case of gold there are, moreover, numerous additional hints pointing to manipulation. Statistics and similarities make it highly probable that systematic downward manipulations of prices in platinum exist as well. Who is their likely originator? Traditionally, four institutions take part in the platinum fixing, which participate, however, in trading as well. In addition, there are their customers, who place their orders for the fixing via telephone. The fixing price is determined in an auction. The manager of the session calls out a price intended to match as many buy and sell orders as possible. Usually the first price doesn’t meet the requirements. Therefore, additional prices are subsequently called out. During this time period, orders can be adjusted. Participants use the ongoing market trend to orient themselves, especially that on the COMEX futures market. Trading there takes place concurrently. As a result, not only the institutions but also their customers involved in the fixing are possible manipulators. Third parties can also exert influence aimed at the fixing price, by manipulating the prices of futures on the COMEX during or shortly before the fixing process. They can thereby influence the fixing participants, who use the futures market for orientation. In a sense, they achieve manipulative leverage in multiple form: for one thing through the participants in the fixing, who use the futures market as a guideline, and for another thing by the fact that the fixing price is used as a reference price for subsequent trades. In addition, leverage is employed in the futures market itself. There have long been hints that systematic manipulation of gold and silver prices via the futures markets is taking place – also during the fixing. Due to the many similarities, it seems likely that the futures market also plays a decisive role with respect to manipulation of the platinum fixing. The one-sided direction of the fixing manipulations over many years is conspicuous. Conventional manipulations can be excluded as a possible reason. These could, for instance, have the goal of creating profits for option writers or other holders of securities tied to a benchmark. However, in such manipulations, one would expect that prices would be manipulated to the upside just as often as to the downside. This is, however, not the case with platinum, and neither is it the case with gold and silver. Thus, the manipulation of the platinum fixing, similar to that in gold and silver, amounts to systematic price suppression. At the PM fixing in London, the platinum price is subject to systematic downward manipulation. In the time period examined, there have been more than 200 instances of falling prices outside the range of expectations. The analogies to gold and silver manipulation are striking. Market participants in the concurrently trading futures market cannot be ruled out as the culpable parties.